This magnificent resort renovated in fall 2017 is located on shore of one of the most beautiful white sand beaches in the world. 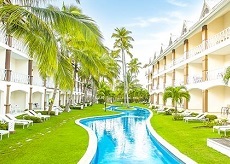 The Majestic Colonial Punta Cana is a spectacular All inclusive resort, perfectly aligned with the exuberant flora and fauna of the Dominican Republic, all in harmony with the gentle breeze of this incredible coast. This is without a doubt, the perfect place to relax while enjoying a privileged surrounding. 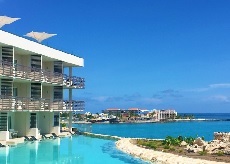 The perfect location for your wedding, practice your favorite sports, kids can enjoy our Splash Kid Club, sample exquisite gastronomy, go shopping, and see spectacular shows played to the rhythms of the Caribbean, and a perfect location to host your Meeting or Incentive Program in a relaxing atmosphere. This beachfront resort was newly refurbished in 2010 and lies on a seemingly endless white beach next to Riu Palace Macao and the Caribbean Sea. The Moroccan-style architecture, with mosaic domes, archways, and white columns with fanned palm trees, adds glamour and distinction. A magnificent pool with a swim-up bar shaded by another dome faces the turquoise sea. Riu Bambu is the perfect place for families; the kids' pool features a special water play area! RiuLand Mini-Club provides activities for kids ages 4-12. Adults will enjoy the casino and free entrance to the disco. Complimentary 24-hour WiFi is also available in the common areas of the resort (available in rooms for an additional charge). Adults also have their own entertainment activities throughout the day. Water sports, such as windsurfing, sailing, kayaking, and body boarding are included! One introductory scuba diving lesson in the pool is also included. Every evening, enjoy live music and shows. Your palate will be delighted with the many dining options available. Guests can partake in Asian, Italian, International buffet, and Grill Steakhouse cuisine. Delicious snacks are available 24-hours a day as well as unlimited drinks. Each room comes equipped with a fully stocked mini-bar and liquor dispenser! Welcome to Riu Republica, a beautiful four-story property located on the beachfront of Macao in Punta Cana. This adults only property features 1007 guest rooms that include balconies or terraces, minibars, free wireless internet access, and more. Complete with a variety of upscale amenities, the resort offers the chance to enjoy physical activities like volleyball, table tennis, windsurfing, kayaking, and water polo. Those looking to relax can visit the wellness center and indulge in a beauty treatment or steam bath. Sprawling out by two available infinity pools is no problem thanks to free sun loungers, towels, and parasols. 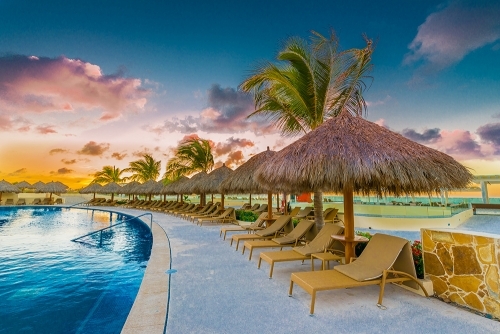 Grab a drink at the poolside bar or swim-up bar while you catch some rays! If you prefer the beach, free sun loungers are available for enjoying the sand and surf. Entice your palate with one of four delectable restaurants, including Asian, Italian, and grilled specialties. Additional breakfast, lunch, and dinner items can be found at the buffet restaurant. You can even enjoy themed buffets three times a week! For a little extra romance with the one you love, opt for dinner on the beach. If you fancy an after dinner drink, the lobby, lounge, or sports bar will provide you with delicious premium beverages. The sports bar is open 24 hours a day, so be sure to visit whenever you are in need of a refreshing drink! The minibar and liquor dispenser in your room are also restocked regularly, so beverages will always be within reach. Discover the colors of Punta Cana at Sirenis Punta Cana Resort Casino & Aquagames. This all-inclusive resort is situated in one of the most beautiful coconut groves in the Caribbean, bordering a stunning white sandy beach. 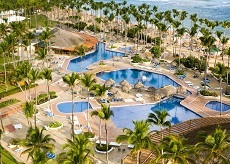 Sirenis Punta Cana Resort Casino & Aquagames is the ideal destination for an unforgettable vacation. 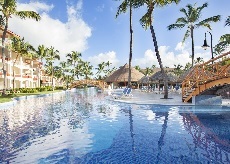 There is something for everyone at Sirenis Punta Cana Resort Casino & Aquagames. Immerse yourself in beach-style pools, or relax on the sun terraces and enjoy the incomparable white sandy beaches with crystal clear waters. You will find many activities to ensure fun all day long: dance lessons, windsurfing, mini-club, beach volleyball, and archery to name a few. Come and slide into fun at the Sirenis Punta Cana Resort Casino & Aquagames Water Park which offers swimming pools, water slides, and a themed children's area. Evening fun is guaranteed with top rated nightly shows, casino, and a nightclub; everything for your evening entertainment.